Technicians now sign off on their work with a business card and a rose. 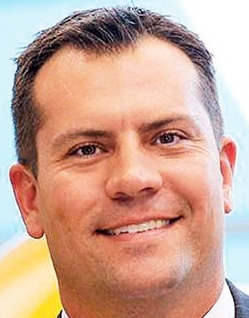 Chaz Gilmore rose to general manager of the huge Grapevine Ford-Lincoln store in Grapevine, Texas, because he knew how to sell cars and was a master of online sales. His successes made him a rising star in the nation's fifth largest auto dealership group, the Van Tuyl Group, which owns Grapevine. The dealership sells 300 new and 200 used vehicles a month. But the ambitious young dealership executive had a dirty little secret: He was scared to show his face in his own service department. "I tried not to go back there for fear that somebody would figure out I didn't know what I was doing," says Gilmore, now 33. To avoid facing the issue, he hired outside professionals to run service for him so he wouldn't have to worry about it. But the department, though profitable, stubbornly underperformed. That was no small problem. The service department at Grapevine employs 70 people and has 64 bays. The department's revenues last year, including service and parts, were $18.1 million. "I was having all kinds of struggles with service, and I'm thinking, 'Why can't I get this?'" Gilmore says. Then inspiration came to him from an unlikely source: Ford CEO Alan Mulally. In May 2012, Gilmore attended a Ford President's Award ceremony in Beverly Hills, Calif., where he received a copy of Bryce G. Hoffman's American Icon, a narrative about Ford's comeback from the financial brink led by Mulally, who had autographed the copy of the book. “Why can't I get this?” General Manager Chaz Gilmore asked after struggling with his service department. Then he got it. On the flight from Los Angeles back to Dallas on May 24, Gilmore cracked open the book and began reading about Mulally's weekly Business Plan Review meetings. Each Thursday morning, leaders of Ford's business units gather to go over their progress in implementing the company's One Ford global plan. Those meetings, which emphasize open communication and frank discussion of problems, have become a cornerstone of Mulally's turnaround. A light bulb went on in Gilmore's head. Connecting to the American Airlines onboard WiFi system, he fired off an e-mail to the leaders of his service department. He asked them to join him for a meeting in his office at 6:30 that very evening. Gilmore was so excited by his idea that he didn't go home and change. He drove straight from Dallas/Fort Worth International Airport to the dealership and showed up wearing shorts, a T-shirt and sandals. Thus was born Grapevine Ford's version of Mulally's Business Plan Review meetings. Gilmore came up with his own name: Key Information Meeting. The meetings now convene every Monday and Thursday at 2 p.m. and last about half an hour. It didn't take long for Gilmore to find out how out of touch he had been with his own service department, and the meetings proved to be the catalyst to change that. "Our technicians and advisers and even management and associates weren't communicating well about all the issues and concerns inside of the store," he says. "Now there's a format where everything is brought to every associate and shared." Attending the meetings are about a dozen of his top service and parts managers and other officials, including the controller, service director, service drive manager, customer relations director, fleet service director, shop foreman, three team leaders, the parts director, director of the service administrative staff and head of the Quick Lane department. Sometimes, Ford parts and service reps sit in. "One of the main rules we made about that meeting is when we're in that meeting there are no titles. Whenever we leave that meeting we all have to agree." Using a new scorecard system, the team works to identify problems and solve them early. The store started keeping track of the performance of its service advisers and technicians via a scorecard that measures such things as sales per repair order, hours per repair order and individual customer satisfaction. "There is definitely a culture of accountability in our store," Gilmore says. "We show all the numbers, both good and bad. The more information everybody has, if they're the right people, the better chance of fixing any deficiencies we have." The scorecards are meant not to punish people but to spot problems before they get big and to help people improve their performance, Gilmore says. "We're able to see when a technician is sliding or having issues," he says. "The whole conversation is about how we can help them turn more hours." If one of the service advisers or technicians is struggling, for instance, to sell more batteries, the problem gets addressed in the meeting along with possible solutions for upping sales. Gilmore works with his team members constantly to be sure they're doing all they can to increase penetration. "If that customer takes his vehicle to an aftermarket outlet, they will tell him it needs other work. Then potentially they don't ever come back." The results of Gilmore's involvement have paid off. "We moved up from roughly 8 percent brake-tire-battery penetration to 13 to 14 percent," he says. If there are 100 service orders and the dealership sells one battery, that means 1 percent penetration. If the dealership does a brake job, plus tire and battery replacement, that counts for 3 percent. 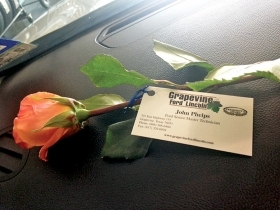 A signature idea that came out of the Key Information Meetings was that each technician started putting his business card on the dashboard of a repaired vehicle with a rose attached. "We believe that if the technician puts his name on it, he's more likely to do quality work," Gilmore says. Once afraid of service, Gilmore now finds it one of the most fascinating parts of the business. "I was insecure," he says. "That's what drove me to dig in back there, to learn it. While doing so I gained so much respect for the business and the mass amount of people they touch. They will touch 200 customers today in my service department. That's a massive flow of loyalists or potential defectors. I intend to keep as many as possible loyal. "I have a great sense of security knowing that twice a week I'm going to look in the eyes of 10 to 12 of my service leaders and they're going tell me what changes are needed. The thing that drove me to it wasn't the profit piece of it. I always looked at service like they were the keepers of the owner base. I went back there to protect my future."